For nearly ninety years, diners in the Cranbrook School dining hall have marveled at the clock that hangs high above the fireplace. Designed and fabricated by New York metalsmith Oscar Bruno Bach, the clock is a tribute to George Booth’s beloved Arts and Crafts Movement. 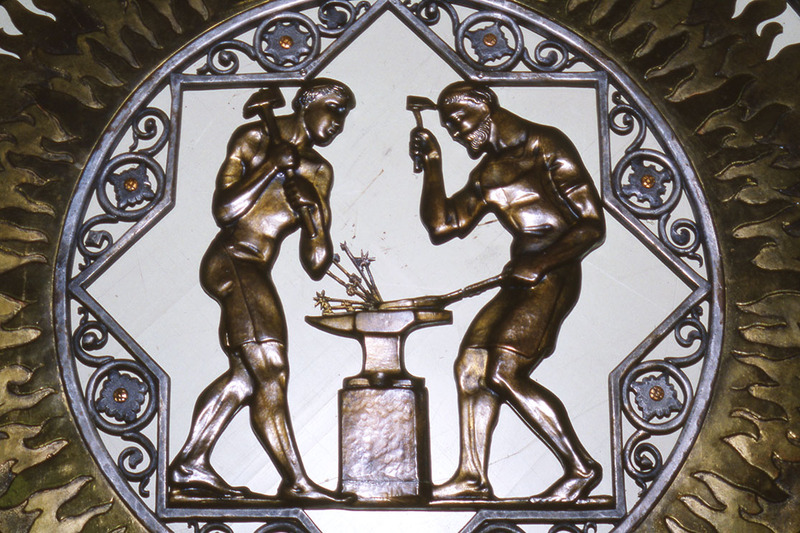 Each hour is represented by an art or craft, ranging from metalworkers to woodworkers. 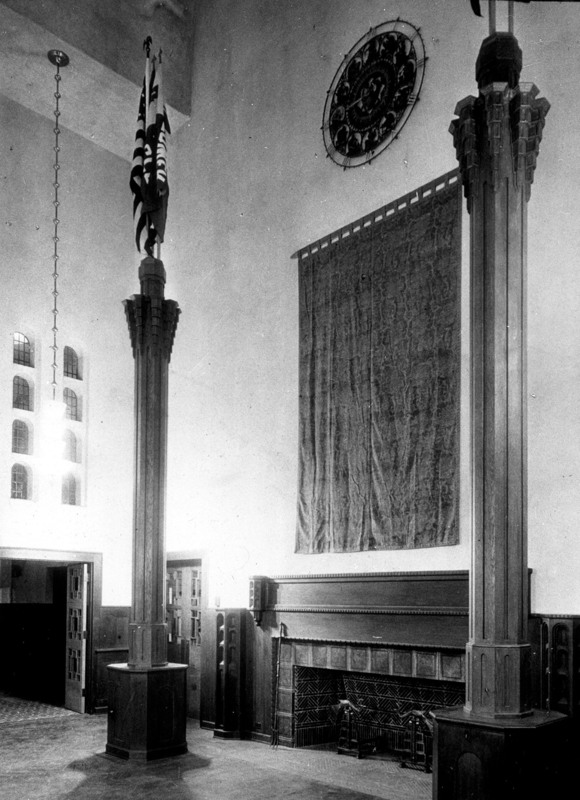 Cranbrook School Dining Hall, 1928. Peter A. Nyholm, photographer. Oscar Bruno Bach (1884-1957), who was born in Germany, came to the United States in 1913 and established a metal design studio with his brother in New York City. As they built up their reputation and the business grew, Bach exhibited his work through The Architectural League of New York and at the Metropolitan Museum of Art, among others. His work graces numerous churches, industrial buildings, and residences primarily in New York but also in the Midwest. His first known work in Michigan was ornamental metalwork for the Blessed Sacrament Cathedral in Detroit (1915). Bach was known for incorporating a variety of metals and metal techniques in his work. Cranbrook’s clock (1926) is made of four concentric iron rings with a center element (two male figures at an anvil) of repoussé brass surrounded by three brass “flame” rings. Each of the twelve figures representing arts, crafts, and trades are also made of brass, surrounded by floral elements made of iron. Copper was used for the rivets and for the small fleur-de-lis elements on the outer rim. Finally, the hour and minute hands are made of aluminum with brass rivets. Detail of the center panel, 2001. The clock was restored courtesy Cranbrook Class of 2000. The clock however was not Bach’s first contribution to Cranbrook. 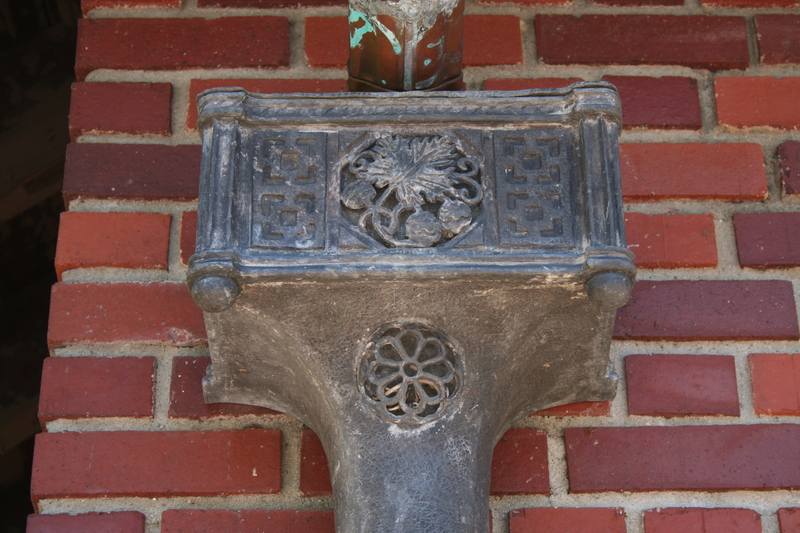 In 1919, he fabricated lead “conductors” for the exterior of the east and west wings of Cranbrook House. George Booth also acquired a smoking stand (1922) and two table lamps (1929) for Cranbrook House, and commissioned Bach to fabricate Cranbrook School’s Peacock Gates (after Eliel Saarinen’s drawings) and the Treasury Door (1928) at Christ Church Cranbrook. Other local commissions include The Detroit Players Club (1925), Moulton Manor (1926), the estate of William Scripps (Ellen Booth’s brother) in Lake Orion, and the First National Bank (1927) in Ann Arbor. One of the four Oscar Bach “conductors” at Cranbrook House, 2004. Mira Burack, photographer. One of the most interesting discoveries I made in writing this post was that the clock used similar elements as doors Bach designed for the new wing of the Toledo Art Museum (1925). They both feature arts and crafts figures – a potter, sculptor, glassblower, draughtsman, metal worker, and bookbinder. In January 1926, Bach received the “Medal of Honor in Design and Craftsmanship in Native Industrial Art” from the Architectural League for his design for the doors so it’s no wonder that he incorporated some of the same elements in the Cranbrook School dining hall clock. I may be a bit partial, but I think our clock is even more magnificent than the doors and I imagine you will too! So interesting! I’d never particularly noticed the clock in the dining hall before. Thanks for all these arcane tidbits! Maybe it will become a Day Away program for the Center.